There is far more life under the surface of your woodlot than there is above. Forest soils teem with life, from microscopic single-celled organisms to rodents like moles and shrews. Most forest soils have a greater variety and number of organisms than agricultural soils. Most people think of forest soils as a rich dark substance, much like compost. If you dig a shovelful of earth and examine it, you'll discover a complex mixture of fibrous roots, decaying leaves, and crumbling organic matter. Dig deeper, however, and you'll reveal much more about your woodlot soils. First, let's look at how soils are formed. The mechanisms of soil formation are the same today as they were millions of years ago. All soils begin as rock, which breaks down over time. It can be challenging to realize that every rock has the potential to be soil someday. We're used to phrases such as "solid as a rock", and tend to think of rock as a permanent substance. But given time, wind, water and sun, all rocks will break down into smaller pieces and eventually become soil. This process is called weathering. Most soils in Nova Scotia are the result of glacial deposits. As glaciers receded some 10,000 years ago, they left a landscape of scoured rock and rubble. As bacteria and other organisms colonized this material, the biological activity formed what we call soil. Figure 36: Plants erode rocks by splitting them into smaller fragments. Bacteria multiplied, died and decayed, raising the organic content level of the soil. Seeds found their way to this place and plants, with the assistance of nitrogen fixing bacteria, became established and provided nutrients for other plants. Once plants became established, they provided the nitrogen that was essential to other forms of life. Gradually, over many years, nutrients began to build up in the soil as plants died and decayed. 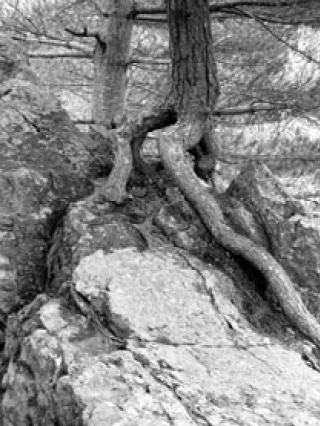 The roots of new plants crept into cracks and crevices in the rocks, further contributing to the process called weathering. Acids secreted by lichens and fungi etched new holes in the rocks, providing footholds for mosses that shelter bacteria and fungi. Over time, the soil was built up and was capable of hosting other plants such as trees and shrubs. Ecosystems of plants and animals were formed. The weathering of rocks eventually forms soils having three primary size classes: sand, silt and clay. The combination of these particles contributes to soil texture. Loams are familiar to most gardeners. A loamy soil has a good mixture of sand (40%), silt (40%) and clay (20%) for plant growth. The texture of a soil can be estimated by rubbing a small amount of moistened soil between your thumb and forefinger. Sandy soils contain particles that can be up to two millimetres in size. As you rub it between your thumb and forefinger, sandy soil feels gritty. If you moisten sand and try to form it into a ball by squeezing it in your hand, the ball crumbles and falls apart. Sand does not feel sticky. Silty soil is composed of smaller particles than sand, and they feel smooth and greasy when rubbed. Moist silty soil can often be molded into a ball without crumbling, and silt does not feel sticky. Clay soils contain the smallest of soil particles. They can be easily formed into a ball, and feel smooth and sticky. Forest soils contain a combination of sand, silt and clay. The relationship between texture classes can be viewed by using a texture triangle. 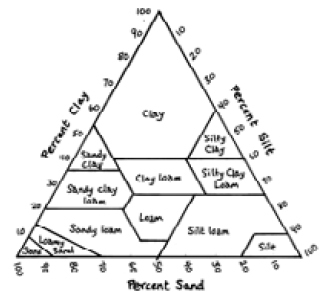 Figure 37: This texture triangle can be used to determine the com-position of sand, silt and clay in a sample of soil. A healthy community of soil organisms is vital to the health of forest soils. Soil organisms provide nutrients for plant growth, decompose organic matter, promote soil structure and porosity, and help break down pollutants. In the presence of organisms, organic matter is constantly being recycled. Most decomposers of organic matter live their entire lives in the soil, consuming plant matter, dead animals and waste products. A soil's fertility directly depends on the abundance and level of activity of soil organisms. Their efforts ensure that nutrients are recycled and organic matter is distributed throughout the rooting zone, holding water and nutrients for plants to use. A single plant may have more living material beneath the soil than it does above the surface. Plant roots are covered in tiny hairs which greatly increase the surface area of the roots, allowing a much higher uptake of water and nutrients. These root hairs release chemicals into the soil that are attractive to nitrogen-fixing bacteria. The specialized bacteria are compatible with a limited number of plant species, and form associations with them by stimulating them to form nodules on their roots. The bacteria live in the nodules and convert gaseous nitrogen to ammonia which is used by both the plant and the bacteria. In turn, the plant supplies water and nutrients to the nodules of nitrogen-fixing bacteria. This partnership is called mutualism, in which both partners benefit from the presence and activity of the other. 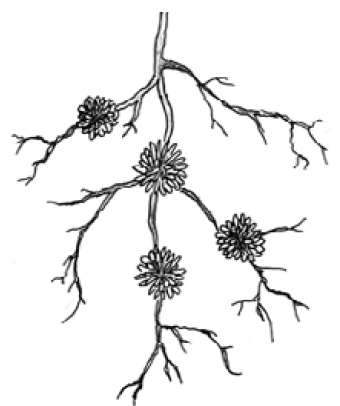 Figure 38: Root nodules containing nitrogen fixing bacteria. Nodule-bearing plants are able to colonize some of the most barren environments on Earth, and live in places where plants without nodules cannot initially survive. After the nitrogen-fixing plants have lived in an area for a time, and converted nitrogen into an available form, other plants are able to colonize the area. Other important relationships that exist between plants and other forms of life are partnerships with fungi. Fungi can access tiny pores in soil, taking up water and minerals. However, fungi rely on the photosynthesis of plants to provide energy and food. Long strands of fungi, called mycelia, wrap around and entwine the roots of plants. Although they have a different structure than roots, mycelia serve as an extension of plant roots and are able to tap into a much greater volume of soil than roots alone. Strands of fungi also have the ability to make phosphorus and sulfur available to the plant, and are important in the cycling of these elements. Fungal strands that partner with the roots of plants are called mycorrhizae. At first glance, roots that are surrounded by mycorrhizae appear moldy, and before there was a good understanding of the roles that fungi have in helping plants grow, many people assumed that all fungi was harmful to plants. Further research revealed that some fungi can improve the health of plants, and can be essential to the plants' survival. Other fungi, such as Armillaria, can cause root rot and can be serious problems in forest soils. When most people think of fungi, they think of mushrooms. Actually, mushrooms that you may see in your woodlot at certain times of the year are only a small part of the entire fungal organism. Strands of mycelia may reach out for many metres from the mushrooms, which are the fruiting bodies, or reproductive parts, of the larger organisms that live in the soil. Often, colonies of mushrooms can be found near the bases of trees. These clusters of mushrooms indicate that millions of strands of mycelia are sharing resources with the tree. Think of the trees and other plants on your woodlot, and imagine the vast network of mycorrhizae that exists beneath the surface of the soil. Think of the vast amounts of water, nutrients and energy that flow beneath your feet. Think of the billions of soil organisms that are working to mix mineral soil with organic material, and the life-and-death scenarios that are being played out in miniature as they feed upon one another, providing more organic material to the immense food web of the soil. 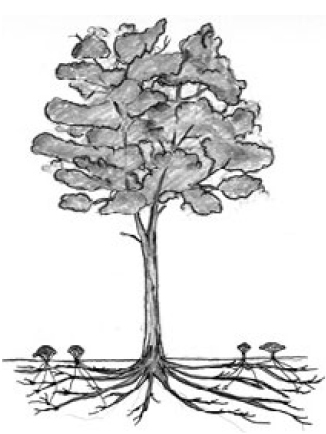 Figure 39: Strands of fungi called mycorrhizae form special relationships with roots of plants. Healthy soils are teeming with life. A few teaspoons of soil from your woodlot can hold millions of bacteria, which are the foundation for all life in the soil. There are millions of species of bacteria in a single square metre of soil, and total populations can be in the vast feast for predators. Because bacteria are so small, single-celled organisms called protozoa can feed on them. As organisms increase in size, there are fewer of them in a square metre of soil. For every protozoa there can be nearly a thousand bacteria. 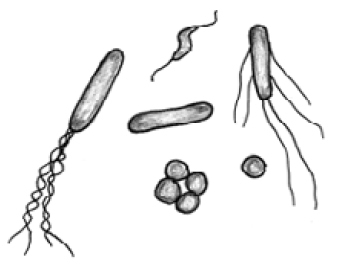 Figure 40:Microscopic soil bacteria are the great decomposers of organic matter. 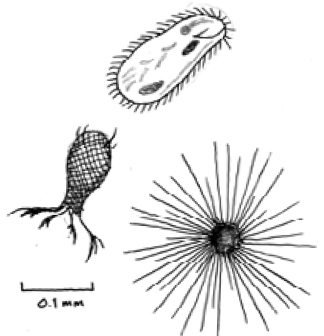 Figure 41: Soil protozoa feed on bacteria and provide nutrients for other soil organisms. Protozoa are, in turn preyed upon by nematodes: tiny worm-like animals that average about a millimetre in length. 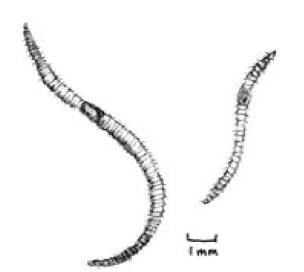 Nematodes, with their long sinuous bodies, can move among the small spaces between soil particles in search of prey. There may be as many as five million nematodes in a square metre of soil. 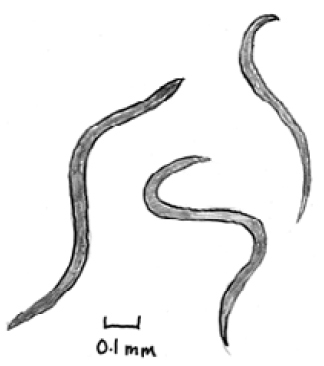 Figure 42:Tiny nematodes move through the soil in search of food. Roaming about the loose humus are small spider-like creatures called mites, and tiny insects called springtails. Mites are often covered in a hard shell that helps them avoid predation by larger animals. 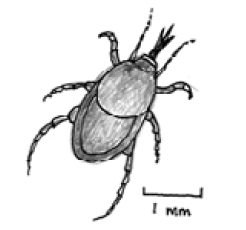 Mites can be over a millimetre in length and there can be up to 400,000 mites in a square metre of soil. While many species of mites are predaceous, some are not, and burrow through the humus, eating, digesting and excreting plant material. Figure 43:Soil mites prey on small insects and nematodes. Mites and springtails are among the most numerous arthropods on Earth. Springtails have uniquely adapted to life in the moist, dark soil. They have very weak eyesight and, like all insects, springtails have six legs. Springtails also have a forked mechanism "like a spring" that allows them to escape predators. During winter, the surface of snow is often peppered with tiny jumping springtails, which have earned them the name "snow fleas". In the soil, springtails feed on decaying plant material and are preyed upon by other insects and mites. Figure 44:Springtails can move quickly through the soil with special spring-like appendages. The incredible variety of insects on Earth has made them an important component of healthy soils. Insects help decompose plant and animal material, and are major predators in the battle of life and death in the soil. Besides springtails, soil insects include ants, crickets, beetles, earwigs and weevils. Other insects, like some species of moths, spend part of their life cycle in soils. All contribute to the richness of the humus, with their tunneling, feeding and excreting activities. Perhaps the most familiar inhabitants of the soil are worms. Both potworms and earthworms are important movers of soil, which keeps the soil well mixed and aerated. Potworms look like miniature earthworms, and both potworms and earthworms digest plant matter and excrete it back into the soil. After a rainy summer night you may find small mounds of excreted material on your lawn, next to holes used by earthworms. The high water content of the soil, resulting from rain, has forced earthworms to the surface during the night. These mounds, called castings, are composed of a mixture of mineral and organic matter. It is easy to see why earthworms are called the great movers of the Earth! Nearly all species of earthworms that are found in abundance in Nova Scotia's soils have been introduced from other countries. Figure 45:Potworms are significant decomposers of organic matter in soils. Other visible inhabitants of the soils of your woodlot include snails, slugs, millipedes and centipedes, which all play roles in mixing, mulching and decomposing plant and animal material. Some larger animals can be difficult to find, unless you go looking for them. Many species of amphibians and reptiles have nests in the upper parts of the soil and under rocks and decaying logs. Amphibians like newts and salamanders seek shelter beneath logs where the environment is cool and moist. Features of your woodlot such as large logs and coarse woody debris are ecologically significant. Eastern garter snakes build their nests in shallow burrows and are contributors to soil health. Larger mammals such as moles, shrews, white-footed mice and eastern chipmunks are effective excavators of forest soils. Their tunnels and dens contribute to the aeration of soil and provide habitat for other organisms. We've seen how soil organisms and organic matter can have far-reaching effects on the health of your woodlot. Now let's look closer at the mineral soil component. If you have a woodlot road, you are likely familiar with the distinctive horizontal bands of colour of exposed soil next to ditches. These layers, or horizons, can tell us about the history of the soil, its composition and the chemical reactions that have taken place. 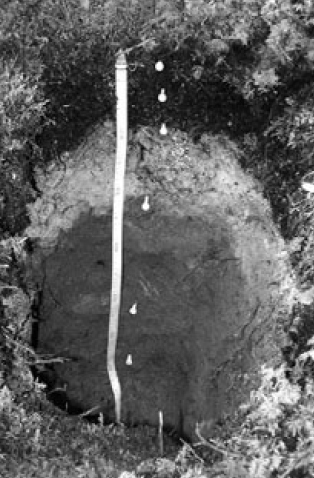 Figure 46: A soil profile reveals the horizons present in forest soils.(NSDNR) . Whenever organic matter or elements such as iron and manganese accumulate, react or combine in soil, they often form colours that can be used to interpret details about the soil. Each horizon has a unique story that we can attempt to read. At the surface of the soil, the organic (O) horizon is made up of three separate layers. On the very top is the litter (L) layer that consists of dead plant material that has accumulated over time. Twigs, leaves, animal remains and wastes, and other detritus of the forest are distributed loosely on the forest floor. Some decomposition has begun to take place, but the structure of the litter is mostly intact. Below the L layer is a band of organic material that appears as if it has been finely mulched. This fermentation (F) layer consists of the material that results from the initial breakdown of litter. Soil organisms play a major role in the decomposition of litter as leaves crumble, fungi feed on woody material and snow and rain break the larger debris into smaller pieces. Humus (H) is the next stage in the process of decay, and the original plant material can no longer be identified. Some humus particles are small enough that the action of water leaches them downward into the mineral soil. Below the organic horizon are the first soil layers that contain mostly minerals and inorganic elements. In some cases, insects and earthworms mix humus with the top layer of mineral soil, called the A horizon. Deeper still, the B horizon receives minerals that have passed through, and may be altered by, the A horizon. Some organic matter may find its way here in limited amounts. Below the B horizon, and mostly undisturbed by soil formation processes, lies the C horizon.